The paper for this package was a gray shopping bag which had a white "label" imprinted with the retailer's logo. I made a small, 3-piece collage on this imprint. I added the recipient's initials. Then I wrapped a piece of gauze ribbon in a spiral around the package. The finished wrap had a stimulating variety of textures, with subdued, tasteful coloring. Foil paper folds easily. The resulting paper has a delightful embossed feel to it. I made a gold foil holly-paper label, writing the name with paint markers. After I glued it on the red foil wrap, I made a "ribbon" of green foil paper and taped it on the back. 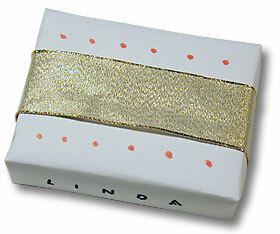 Two kinds of ribbon are wrapped around this gold-foil small package. First I taped a piece of blue ribbon on the back and wound it around many times till it was ready to tape again on the back. Then I did the same quick spiral technique using a piece of gold cord. I finished with a round office-supply sticker, to carry the intitals of the recipient. This wrap relies on the contrast of rough brown industrial paper with white gauze ribbon. 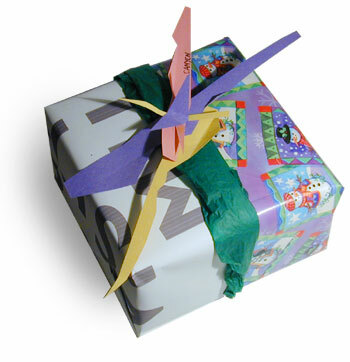 I had saved this ribbon with the bow intact: a wrap artist saves time by conserveing. The label was made with computer-label paper; the image was from our home-made Christmas card. 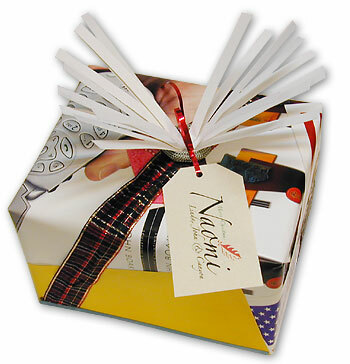 This little package gains remarkable visual power from its contrasting papers. A black office-supply dot serves as its label. The basic wrap is brown paper. The collage is fragments of Christmas papers. The "bow" is made of thick red paper strips with a center of wadded red tissue with one black dot inked in. The basic wrap is made with two very different papers. On the left is a scrap of white paper with large text inkjet printed on it. 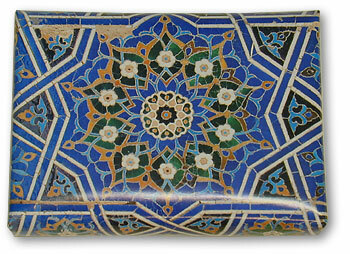 On the right is a fragment of Christmas paper. They are bridged by a twist of green tissue. The "bow" is made of scrps of construction paper. 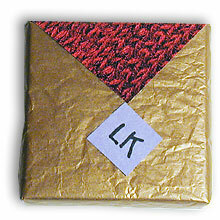 On a brown wrap, we have added a variety of textures, including foil paper, a piece of an art-print proof, a small round sticker, and a piece of a wine-bottle protective wrap. Tissue can be folded into puffy "ribbons". 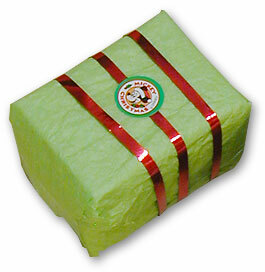 We wrap many of these around a small package and finish it with a small red triangle which serves as the label. 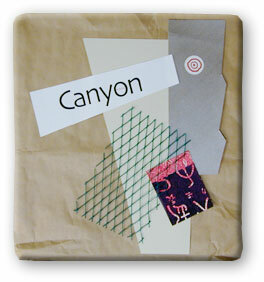 The shiny gold tissue contrasts with the simple collage of similar forms. The red triangle is from a marketing brochure. 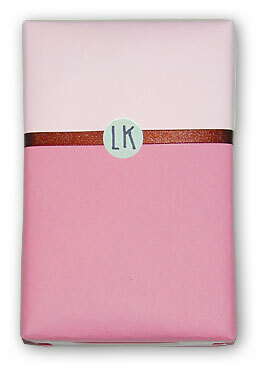 The soft contrast of two pinks makes this package very elegant. Red ribbon joins the two fragments. The collage is fragments of brochures and flyers that came in the mail. The "bow" is made of thick white paper strips glue gunned in place. A ring of fat cord, taken from a shopping bag, is glued around the base of the bow; it pushes the white strips up. 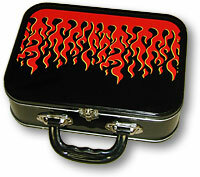 The inner wrap is a gift itself, a flaming lunch box, containing a group of five wrapped presents. 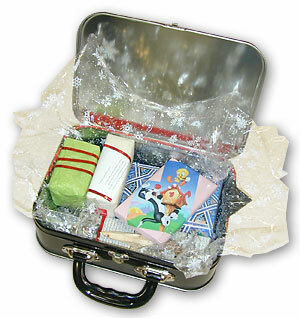 Inside the lunch box is a team of presents with a contrasting variety of wraps. Commemorative postage stamps often have large images alongside the stamps. This one came from stamps honoring Hollywood and film making. The image is of producer Otto Preminger on a set. The recipient of this gift is a video producer. Red foil ribbons complete the job. 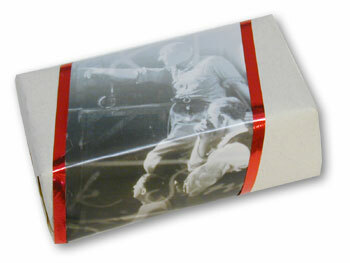 The wrap artist can sometimes permit the wrapping of small packages in a single piece of paper. This one was a piece of direct mail. Another postage stamp leftover is stuck onto a wrap of pink paper. 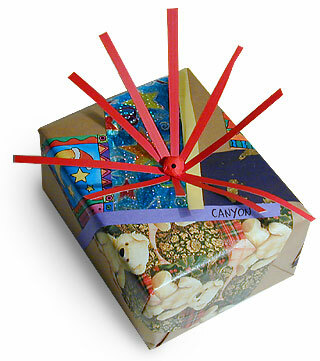 When wrapping a group of small presents, the group benefits from contrast of visual style. This is a study in contrasts. The base wrap is a Pakistani newspaper pick up in a cab ride. 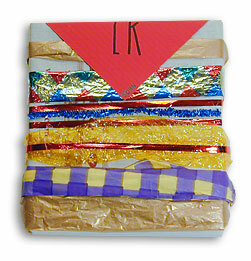 Gold and red ribbon bring that vital extra element of complexity. On top I have glued on a carved twig and an acorn. The twig has two contrasting surfaces itself: a russet and gray natural surface and the fresh bright wood revealed by the carving. Altogether, the subtle contrasts between all the materials add up to a delicious whole, with a unique feel. 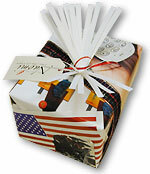 Tissue adds another contrasting texture of paper to the team of packages. Foil ribbon contrast well with the tissue. And a commercial Christmas sticker adds the finishing touch. The collage features three papers: a photo of archtictural sculpture from a direct-mail car ad; a red gift bag, and ripped, brown construction paper. The bow is made by capturing a square of blue paper between the ends of an orange shopping bag string. Hot glue attaches the ends of the string to the card and the center of the string to the package. The resulting tag can be placed in a variety of positions. And it works as a handle. A photo of roses, taken from a calendar begins this wrap. Dull blue construction paper contrast with the photo and with the red-foil bottom section. The three papers are joined by red foil string on the top and a band of pale-blue folded tissue on the bottom. The name tag is a small square of green plastic that gives dimensional detail to the wrap. On a brown wrap, we have added a variety of textures. First is a layer of plastic wine-bottle mesh. Next we added a frame of folded green mylar, itself framed with a band of orange shopping-bag string. 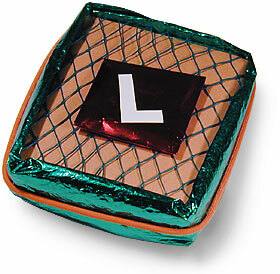 Then we made a red-foil folded-edge medallion and applied a white name-tag "L" using a scrap of self-adhesive paper. 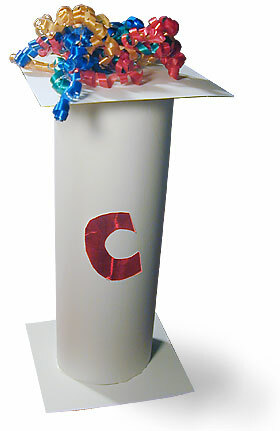 The side wrap is a variation on the concept of ribbons and bows, making a unique and novel look. The gold ribbon goes on fast in this version of a white-wrap. 12 dots with a colored pencil, a name, a we're done. The base is pink tissue. 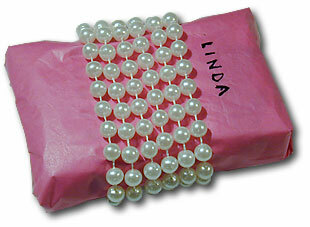 The plastic pearls are the "ribbon," bringing a delightful texture that calls out for enquiring fingers. 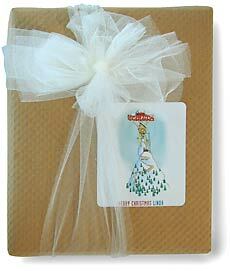 This white-wrap takes the idea of the ribbon and places it around the sides of package, covering up the folded ends. 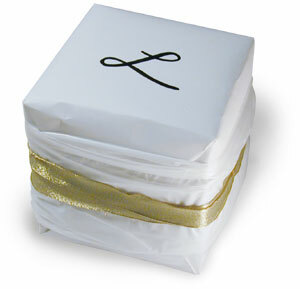 The gold ribbon has a white wrinkly foundation made from a two-layered plastic shopping bag. The top is left bare for the tag initial. 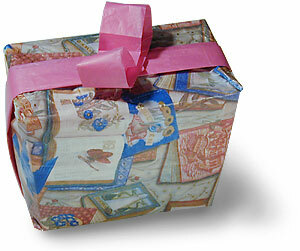 Tissue is one the most versatile of all wrapping materials. 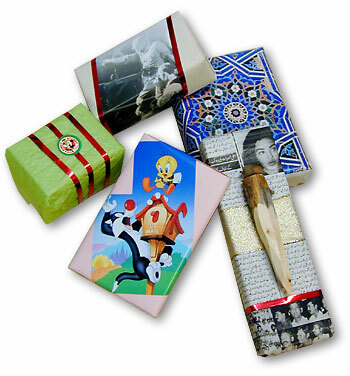 Many gifts come with ample supplies of it inside the gift box. 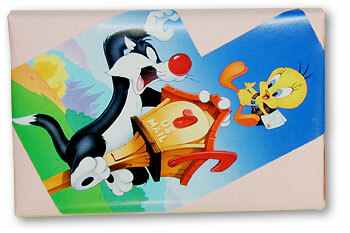 It recycles easily, since it is wrinkly by nature and survives storage better than anything. And it is easy to work with, hiding errors and encouraging invention, like the pink ribbon and bow shown here, which are made with a strip of tissue that has been folded over a couple of times. This wrap holds a six-pack of soda. 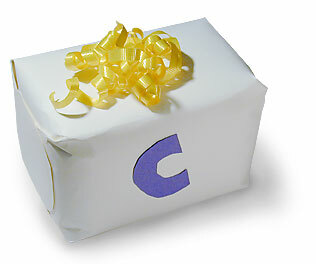 It is wrapped in thick white paper, without a box. We did use a hot glue to close it up; this make the package quite dimensionally stable. We glued on the recycled bow and the hand cut monogram/label. The same stiff paper made this unique boxless wrap for a package of chocolate cookies. Once again, hot glue holds it all together. One strip made the column. Contemplating for a few seconds how much trouble round end-caps might be to make and glue. We decided to cut two squares of the stiff paper. A few dabs of hot glue around the ends of the cylinder were all it took to attach the end caps. A recycled bow and a hand-cut initial/tag finished the job.